Brightening Chicago's streets and schools, the murals and mosaics of Olivia Gude and friends address social divisions--and unite communities. When Olivia Gude read about the racial tension-manifested in fights and graffiti-brewing at Chicago's Charles Steinmetz High School in spring 1993, she got more than a little upset. She didn't form a committee to discuss the problems, and she didn't write a letter to protest them, but she definitely couldn't ignore them. What that school needed, thought Gude, MFA'82, was a mosaic. So she approached the principal with her portfolio and her idea: to have Steinmetz students work together under her supervision to design and create a multiracially themed piece for the school. The principal gave Gude the go-ahead, and after two years, with the help of more than 100 students, Steinmetz High's foyer had 18 sections of mosaic covering over 200 square feet. And at five hours of work per one square foot of mural, the students had plenty of time to talk over their differences. A community muralist and 13-year member of Chicago Public Art Group (CPAG), Gude sees art not only as a way to beautify the world but also as an agent of social change, a means to reclaim public space and bring people together. Fifty or so pieces that Gude has worked on are scattered throughout Chicago-area streets and schools. If you've been in Hyde Park sometime this decade, you've probably seen either the mural on the 56th Street Metra underpass, featuring strikingly real portraits of commuters and their musings on life, or the brightly hued nature scenes gracing the game room at International House. Other works adorn a freeway wall in Los Angeles and a bus in Russia. Her painted murals and tiled mosaics-created in collaboration with other CPAG artists and community members-address themes of race, class, gender, place, and justice. For Gude (pronounced "goody"), it's about fostering "communities of discourse"-physical and intellectual spaces in which to discuss divisive issues and perhaps close some gaps. "What's so interesting"-many of her sentences begin this way-"is the way these murals work. It's the interaction that happens that makes the piece. What does it mean to have black people and white people sit down and talk about issues of community?" asks Gude, putting the question on the table with a quick motion of her hands-three rings on the left one, two rings on the right. "For communities to function, they have to be constantly kept up. There has to be this kind of constant interaction." After majoring in art at Webster College (now University), she began her career in 1973 as a St. Louis high-school art instructor, viewing teaching as "a liberating activity that could change people's perceptions." Two years later, Gude moved to Chicago and started teaching at Bloom Trail High School in Chicago Heights. 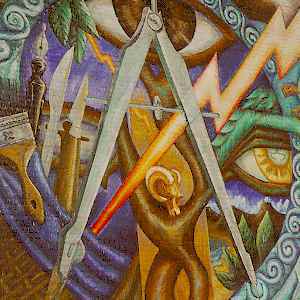 There, students changed her own perceptions, as their interest in painting impelled her to start working in that medium. Most of her prior art-influenced by the women's movement-had involved patterns, fabric, sewing, and assemblage. At Bloom Trail, she also painted her first public pieces: In an effort to keep spring fever at bay, she and fellow art teacher Jon Pounds-her husband since 1986 and the current head of CPAG-enlisted their students in end-of-the-school-year mural projects. But it was when she took two years out to attend the U of C and concentrate on her own work, explains Gude, intense behind round, black-framed glasses, that she "really recognized that art, far from being this preserve that was separate from life, was intrinsically part of all of these issues about culture, about human possibility, about justice." Coming from a large, working-class family in St. Louis, she strongly felt that art, even "of the highest complexity," didn't have to address an elite audience or exist only in museums and galleries. Gude, along with Pounds, acted on that belief by doing street pieces-without permission, but using temporary materials such as chalk-around their South Side neighborhood of Pullman. The works soon caught the attention of CPAG, known then as Chicago Mural Group. The group gave Gude a "second graduate education," this one in the techniques and philosophy of the community mural tradition, while she taught part time at Bloom Trail, held residencies in other schools, and lectured at area art schools and universities, including the U of C. Rooted in the late 1960s, the contemporary mural movement, of which CPAG is a part, emphasizes a mentoring style of training and the idea of a multicultural America. CPAG's 30-plus members, some of whom Gude has herself helped to train, span a range of races and nationalities. The members often collaborate, and Gude in particular ascribes to the method: She is usually one of two or three lead artists assisted by a number of volunteers. Gude speaks of the concept of the collective as "a terrifically important image" in present-day America, "a society of hyperindividuals." "It's completely different from a Nietz-schean view that what you really want is one or two supermen or superwomen who can envision this amazing possibility," says Gude. She believes that collaborations create works greater than any one person could make while still allowing for each artist's individual vision. Some projects begin with the artistic team suggesting a mural to a community, then talking to residents and local leaders to drum up support and volunteers. Both are usually in generous supply, in part because CPAG makes sure the artistic teams represent each community's racial makeup. Other times a community approaches a particular artist or CPAG for assistance. Neighborhood groups and schools cosponsor projects through fund-raising; CPAG may provide seed money or matching funds and also obtains the necessary permits. Community volunteers join artists in group brainstorming sessions and drawing exercises, with those people who have art experience helping to realize the others' images. After decisions on what to include are reached by consensus-not majority rule-the sketches are developed, copied, cut, and pasted into a collage that serves as a model for the final drawing. Once the mural's outline has been traced on the wall, still more volunteers and youth assistants join in the painting. In the past few years, Gude has delved into variations on the traditionally painted mural, including mosaics and spray-painted art. 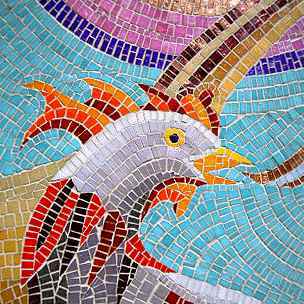 Usually placed in doorways and arches, "mosaics are a way of engaging people as they enter a space," she said in a CPAG newsletter. "There's a pure physicality of the materials and a decorativeness to them that's unbelievable, like patchwork quilts." 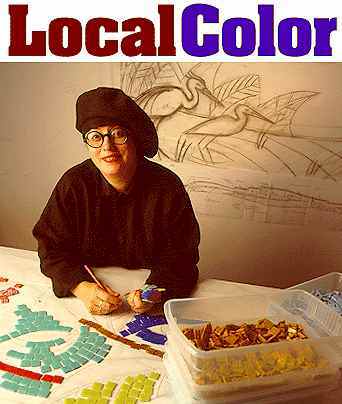 The time-intensive creation of a mosaic involves laying colored ceramic or glass tiles onto a full-scale drawing of the mural. Contact paper holds the tiles in place until they've all been laid down and the mural is ready to be installed, section by section, with the help of professional tile-setters. With mosaics, Gude has explored the visual tension between naturalistic images and the geometry of the repeated tile squares. The wild colors, dramatic lines, and bold words of Gude's spray-can collaborations stand in sharp opposition to the mosaics but still fit in with her goals and interests. "Graffiti artists are not the enemies of the muralists; they're our natural allies," she says. "We were saying, 'Let's push the murals into a new aesthetic, and let's take the skill and visual vitality that these young guys have, and think, what other things beside your name could you write with that skill?'" Gude intends to keep pushing her aesthetic boundaries. An assistant professor of art education and studio art at the University of Illinois at Chicago since last fall, she admits, chuckling, that worries of losing her edge occasionally nag at her. It seems to be no great danger: She's now plotting graffiti mosaics-placing chunks of mosaic, perhaps a glass-tile eye or hand, at random along walls and underpasses around the city. "Would that be bizarre?" Gude asks. "To suddenly find a fragment of a mosaic on the side of a building in an alley or something? Would that be cool?" Pretty cool, but even more exciting is the chance to educate a new generation of Chicago art teachers. With Olivia Gude, it's certain to be a collaborative endeavor. Conceived to help bond the primarily African-American Roseland district and its mostly white neighbor Pullman, this 7,200-square-foot mural takes its name from a line of poetry written by one of Gude's former high-school students: "I welcome myself to a new place where all the people can join on in together." Gude and husband Jon Pounds -- Pullman residents -- teamed with artist Marcus Akinlana and went door-to-door asking for support. Over nine months, more than 100 people from both neighborhoods helped to raise funds and to create the mural, located at 113th Street and Cottage Grove under the Metra railroad tracks that divide Roseland from Pullman. The mural features historical figures from both communities; African, European, and Native-American craft patterns; Dutch farmers; and a contemporary black family. 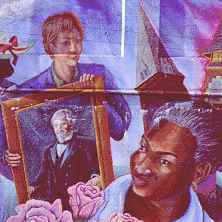 Several years after finishing the project, while working on the Hyde Park mural (above), Gude was approached by a young man from Roseland, who, unaware of her involvement, related the making of the Roseland-Pullman mural. "That was such a great gift, to have that story come back to me," she says. "Instead of this child growing up with only an image of neighborhood segregation, he has a very powerful image of the possibility of cross-racial cooperation." In the spring of 1991, Gude stood outside a Hyde Park train station, tape recorder in hand, asking each passerby, "Where are you coming from? Where are you going?" Answers came on literal, spiritual, and emotional levels as people discussed their families, jobs, cultures, hopes, and fears. Gude, the lead artist, chose the most telling responses and, assisted by Rolf Mueller, painted those comments and portraits of many of the speakers on the underpass. "This mural is meant to ask, Is a neighborhood a community just because the people are in the same geographic space?" Gude says. She doesn't try to answer, letting the words speak for themselves. Text has become increasingly prominent in Gude's art as she attempts to capture "the poetry of the streets," or a neighborhood's oral history. With this piece, she not only set out to reveal a bit of Hyde Park's essence, but also to evoke the city as a whole. Gude points out the muted "Chicago" colors-unusual for a mural-adding, "It's also probably one of the few murals you'll ever see where people are wearing coats." Made of Venetian glass tesserae (tiles), these mosaics frame two entryways of James Russell Lowell School, marking the school's 1994 centennial. Two of them cover ground-level windows that were bricked over for security reasons, a not-uncommon practice in Chicago's public schools. "We 'opened' the windows," says Gude, referring also to Beatriz Santiago Muñoz, Juan Chavez, and members of Youth Service Project. She cites a European tradition of reinventing a space in response to contemporary times, rather than the American way in which old buildings are either destroyed, or deemed historic and left untouched. "It's not defacing a historic building," she adds, "It's adding something at a level of complexity and beauty that really is architectural." In recent years, Gude notes, Chicago Public Art Group has completed several similar projects with Chicago schools, in conjunction with school reform: "Physically working with the architecture becomes part of what it means to have local control of schools... what's going to be taught in the school, what's going to be imagined in the school, what that school means to the community." Painted on the west wall of One Artist Row-a building of art studios and businesses on East 71st Street-this was the third in a series of murals created by the South Shore Arts Enterprise. After a brainstorming committee decided the piece should highlight the building's purpose and reflect the importance of art in all aspects of culture, lead artists Gude and Marcus Akinlana, assistant Ivan Watkins, and 11 local teenage apprentices set to work. Days began with set-up time, followed by a brief meditation, discussion, or lesson, and a harambee-an African-inspired "coming together" cheer. The spiral dominating the wall symbolizes the cycle of death and rebirth, while the tree represents life, knowledge, and creativity. 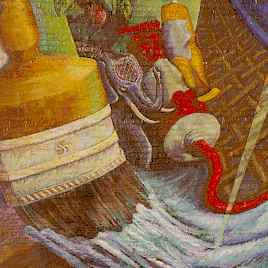 Artists' tools mingle with artistic products and spiritual and cultural symbols from Africa, Europe, Asia, and Mexico. The frames allude to the social conditions in which art is made and seen. Of the final product, Gude wrote, the mural, "while following the mural tradition of incorporating pattern and symbols from the cultures of neighborhood residents, eschewed the tradition of using human figures and an obvious narrative structure."